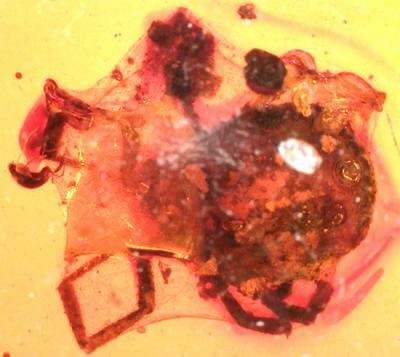 LAWRENCE — One day in Myanmar during the Cretaceous period, a tick managed to ensnare itself in a spider web. Realizing its predicament, the tick struggled to get free. But the spider that built the web was having none of it. The spider popped over to the doomed tick and quickly wrapped it up in silk, immobilizing it for eternity. "It's a show of behavior, really," said Selden. "Ticks already are known from the Burmese amber — but it's unusual to find one wrapped in spider silk. We're not sure if the spider wrapped it in order to eat it later or if it was to get it out of the way and stop it from wriggling and destroying its web. That's something spiders do." "We think this was spider silk because of the angles that the threads make," Selden said. "Also, in the paper, we show a picture of a tick that started to decay — and the fungus on that tick grows from its orifices — from the inside to the outside. Whereas these threads are wrapped around externally and not concentrated at the orifices." "We don't know what kind of spider this was," Selden said. "A spider's web is stretched between twigs to catch prey that flies or bumps or crawls into it. As prey gets stuck, it adheres to the web and starts to struggle. Maybe some things can escape after some struggle, so the spider rushes to it out from hiding and wraps it in swaths of silk to immobilize it, to stop it escaping or destroying the web. This prevents prey from hitting back — stinging or biting — once it's wrapped in silk it can't move, and then the spider can bite it and inject gastric fluid to eat it or venom to subdue it as well." "It's really just an interesting little story — a piece of frozen behavior and an interaction between two organisms," he said. "Rather than being the oldest thing or the biggest thing, it's nice to be able to preserve some animal interaction and show it was a living ecosystem."